Seth Rogen says the crew on 'Neighbors' have been ''blithering like idiots'' doing baby talk to entertain the tiny tots on set. The 31-year-old actor stars as husband and father Mac Radner - who is married to Kelly Radner (Rose Byrne) - and must deal with fraternity leader Teddy Sanders (Zac Efron) who lives near them in the comedy. 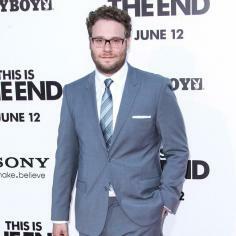 Rogen and Efron gushed over the ''great'' babies and revealed everyone was cooing around them while filming. The Canadian comedian - who married Lauren Miller in 2011 - understands how ''life-changing'' children are and hopes the movie reflects this. Rogen told collider.com: ''These babies have been good though. All the concerns and fears of our characters, that's where a lot of it was born: with conversations that me and the other producers were having.